There have been numerous calls for the voters’ list to be cleaned up, especially in view of the upcoming referendum on taking the Guatemalan claim to the International Court of Justice. 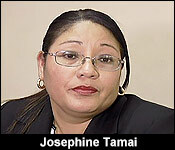 The re-registration process is long overdue and today, Chief Elections Officer Josephine Tamai said the process will begin on July 2. However, the process will come with a hefty price tag of at least eight million dollars. Tamai said the Elections and Boundaries Department will be hiring over three hundred temporary employees for this purpose, which is expected to be completed by December. A hundred registration centers have been identified countrywide that will be accessible to persons during the first two months. Tamai said even persons who recently registered will be required to re-register. March 10, 2019 is the closing date for re-registration in order for persons to vote in the upcoming ICJ referendum. Re-registration isn't been delayed for ten whole years - but after months of debate - it's finally happening. The Governor General has issued the proclamation for re-registration to commence countrywide on July first. "We expect that registration centers across country will be opened on the 2nd of July 2018. Basically, we encourage all the persons who have been registered to come out and reregister. Persons who have not yet registered and qualify to be registered, to come out and register. Persons who suffer from old age or some physical incapacity, those persons can contact the registering officers countrywide and we will reach out to those person to accept their applications. When it comes to qualifications, the persons who qualify to get registered and to reregister. A person must be 18 years of age and is a citizen of Belize or a citizen of a commonwealth country who has resided in Belize for not less than 12 months. In order to be qualified as registered elector in a particular division, persons must reside at that specific address within that division for not less than 2 months, that is crucial. You must reside at your addresses for at least 2 months in order for you to be register for that particular address." "Persons who come to the registration centers are required to bring along with them their original birth certificate and a photograph. The photograph can be on which is signed, stamped and certified by a justice of the peace. We also will be accepting the social security card as a form of identification, a picture ID. Persons can also bring a valid passport with them. Naturalized Belizeans must bring along either their Belizean passport or their nationality certificates. For those persons who present nationality certificated that does not have photographs on them, they are to ensure that they bring along a picture ID again, signed, stamped and certified by a justice of the peace in order for them to be able to get registered." "That is basically saying that any person who comes in must bring an identification card or a photo identification signed by a justice of the peace. The process should take us up until the end of this year which should be December. When we talk about registration centers, we have already identified approximately 100 registration centers across the country where we will be conducting registration during the months of July and August. Once those registration centers are closed at the end of August, then persons will have to go in to the election and boundaries registration offices to apply to register or to reregister." "How do you respond to the criticism that the process of reregistration is unfairly discriminatory against the poorest and most rural Belizeans? Because those who live in urban centers those with means of transportation cheap and affordable means of transportation will inevitably be able to reregister quite easily, but if you live in remote areas, it's a long way and costly way before you reach the reregistration center." "But again like I mentioned, if persons are out there and they know that they want to get registered, as long as information comes to us we will facilitate." Again, Re-registration starts on July first. There are a significant amount of persons originally from other Central American countries who now call Belize home and have been granted citizenship. Among those persons are Guatemalans, which has raised concerns because of the Belize-Guatemala territorial dispute. Many have expressed that Guatemalans who have obtained Belizean nationality not be allowed to vote in the upcoming ICJ referendum. However, Josephine Tamai, Chief Elections Officer said that they will be allowed to participate in the re-registration once they have the proper documents. Tamai said the re-registration process which begins on July 2, should be completed by the end of the year.